The Sustainable Iowa Land Trust announced today the publication of its much-anticipated SILT FARMER VETTING POLICY. For more than two years, young and disadvantaged farmers around Iowa have been asking what SILT will require to farm its farms. Applicants with no long-term access to land but who have experience and a business plan will make the first cut. The SILT Farmer Committee deliberated extensively over issues of equity and historic imbalance as well, and reviewers are instructed to be cognizant of those issues when reviewing applications. In the process of developing the policy, SILT queried land trusts across the country, including fellow members of the Land Trust Alliance and the staff at American Farmland Trust and could not find a policy that vets farmers based on their lack of access to affordable land. 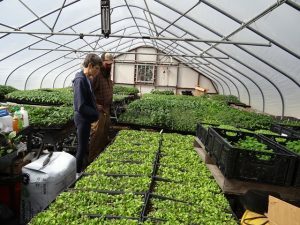 “As far as we know, we are the first in the nation to use economic need and a holistic approach to farming as criteria for farmer candidates,” said SILT President Suzan Erem. “This is what farmland trusts can do best – reducing the cost of land for future farmers.” She thanked the National Young Farmers Coalition for its work on this issue at the national level. Ad hoc SILT Farmer Committee members included: Kayla Koether, chair, Carmen Black, Fred Kirschenmann, Shanti Sellz, Tom Wahl, Larry Cleverley, Neo Mazur, Sally Gran, Jake Kundert, Connie Mathes and Steffen Mirsky. All but two members are or have been farmers. The permanent SILT Farmer Committee charged with coordinating farmer applications is chaired by SILT Board Member Kayla Koether of Decorah. Download FARMER VETTING POLICY or read below. Read the application materials for a general overview, and assess the following. If Need Requirements, Holistic Proposal, and Minimum Requirements are not met, then the candidate is not qualified for a SILT farm. If applicants indicate they are members of an underserved class, this may be a reason to waive minimum requirements for a candidate. Reviewers can proceed with scoring to determine whether to recommend that the board waive the minimum requirements for a candidate. In this first level of vetting, the reviewer is instructed to comply with SILT’s diversity policy by being cognizant of and proactive in adjusting for bias against historically underserved populations. Does this candidate meet SILT’s need requirements; do they lack reasonable access (including via land inheritance, current ownership, or ability to purchase) to farmland suitable for the enterprise being proposed? Does this candidate’s proposal set forward a comprehensive plan appropriate for the farmland in question (for specific application), with a business plan that matches the candidate’s experience and character, and enterprises that fit into the candidate’s life plan? Taken as a whole, can this candidate realistically carry out this proposal? Business Plan: All the required sections must be included for the business plan to be considered complete and reviewed. At minimum, the business plan should show a clear vision of where the applicant is going and a realistic plan for how to get there. Character Traits: At a minimum, all three references should vouch for the candidate’s integrity. Life Plan: At minimum, the candidate should articulate a life plan and a clear rationale for how farming fits into it. The following guide assists reviewers in scoring candidates based on SILT’s criteria. Reviewers should keep in mind that we are looking for candidates who are the most likely to be successful farmers. Criteria can be scored initially, then adjusted after interviews are conducted and references called. References will be especially key to corroborate the candidate’s length and depth of experiences, including the skills learned and competency at key tasks. References will also be important in determining the candidate’s character traits. Reviewers: Refer to the SILT Farmer Vetting Procedure in the SILT Procedure Manual for the forms related to interviewing candidates and reviewing their applications. Income at or below the county poverty level. Minimums for highly niche, specialized, or new enterprises that are not well-developed in Iowa, such as mushroom cultivation, may be given special consideration, but candidates should show a good faith effort to maximize experience in farming and familiarity of their proposed enterprise within those limitations.